The loans occurred when other banks felt Trump and his businesses were too much of a liability with his multiple bankruptcies. Deutsche Bank (holding company) was also one of several banks which was also placed under tighter scrutiny because of its past practices. Most recently, Deutsche Bank failed a Fed stress test. 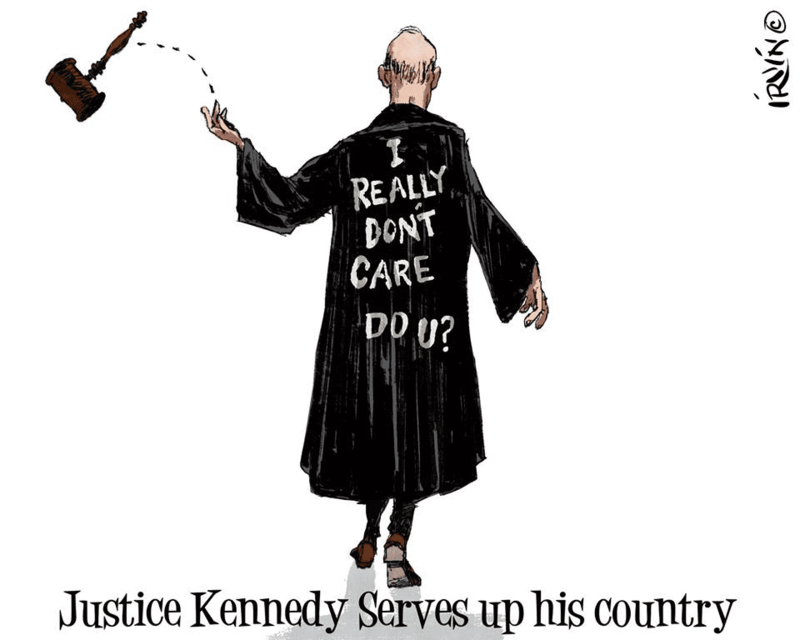 Even though I disagree with some of his opinions, I would not call Justice Anthony Kennedy a fool. He is an intelligent man who has swung the court in the direction he wishes it to go with each of his votes. Given that, he also knows his retirement from SCOTUS will have an adverse impact upon the citizens of this nation which will result from the candidate Mr. Trump selects to replace him. Justice Kennedy simply does not care and his timing was intentional. Just ask Justice Kennedy about how the removal of federal constitutional checks on state and local courts, prosecutors and prisons has ensured our freedom. Well, his, anyway. He’ll tell you. It’s our constitutional design (his word), see. I keep wondering why international human rights organizations don’t aggressively spread information about this country’s states’-rights agenda and it’s huge, appalling consequences, and make clear that this is, virulently advanced by the current Supreme Court. Because, really, only when this gains broad international attention will it begin to end. And, yes, this is what the Court calls, explicitly, freedom. The rest of the civilized world, though, I trust, would call it barbarism. If they knew about it. And really, it’s long past time that they did. ADDENDUM: To clarify, the premise of Kennedy’s states’-rights=freedom shtick is that separation-of-powers=freedom; ergo, Germans, Scandinavians and the Dutch, for example, are prisoners. The selling point is supposed to be checks and balances, but under Kennedy’s brand of separation-of-powers=freedom, there is a separate of powers but there are no constitutional checks on state and local government police and judicial powers. Freedom is defined not by what happens to you but instead by which government, and what part of that government, is doing it. Added 6/9 at 11:34 a.m.